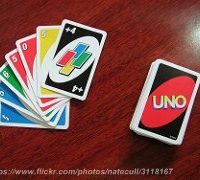 The card game Uno came out in 1971, and it hasn’t really changed, evolved, or branched out in almost 50 years. So this is LONG overdue: Mattel just announced that they’re finally coming out with a sequel to Uno . . . called Dos. Obviously. It looks like the action is pretty similar to Uno, only you call out “Dos” when you have two cards, and then you get points based on the cards in everyone else’s hands.